Washington State offers a wealth of historical and architectural attractions, from the iconic mid-centry modernism of the Space Needle, to the maritime Victorian splendor of Port Townsend. Dozens of beautiful and historic lighthouses grace Washington’s coastal perimeter, from Cape Flattery at the far northwest corner of the state (and of the continental U.S.) to Cape Disappointment at the mouth of the Columbia River to the Strait of Juan de Fuca (which delineates part of the state’s northern border), and all around Puget Sound. Wherever you travel, you’ll find Washington’s rich past standing tall in historical railway stations, homes, theatres, churches, schoolhouses and plankhouses, as well as museums and interpretive centers. So go find the past! And we’ll link you to some well-kept secrets, and some under-explored places to go. Before Your Trip, visit on-line exhibits and encyclopdic information at theWashington State Historical Society and Historylink.org. Make some photocopies of images and bring them along. Look for the same scene today and compare the changes. Be a Detective. Look for clues to the way people lived here 50, 100, or 1000 years ago. You might find clues in the landscape, in structures and implements, in museums, in conversations. Haunt Cemeteries. In fact, make it a point to find out-of-the-way cemeteries. You might even try to learn the stories behind the names on headstones. The websiteIntenment.net can help you find cemeteries or locate where relatives are buried. Take a Scavenger Hunt. Have fun by exploring the small details of a community through a scavenger hunt. Find clues in the landscape, on structures and buildings and inside museums! Brake for Historical Markers. And actually stop. Instead of just reading the text and hurrying on, get out of the car. Close your eyes and imagine the event the marker tells about. Hear the sounds, smell the smells, see the sights. WSDOT database of Markers and Monuments can tell you about markers near your destination. Chat with the Locals. They can tell you all kinds of things – and what better way to connect with a place than through human connections? Get Curious About the “Other” Story. It’s all too easy to stick to the history of our “own kind.” But how limiting that is! How much we miss if we ignore the experience of other people – other groups, cultures, ethnicities, religions. 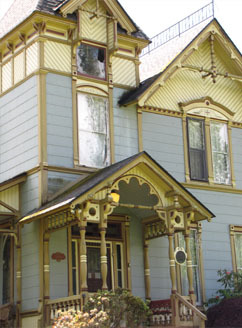 Take a Historic Tour – Many communities offer tours of local historic neighborhoods and other historic sites. Visit the local chamber of commerce to find tour brochures. Visit the Little Museums – Most towns have one. Whether it’s funky or polished, it can give you a glimpse into the town’s values and psyche. And be sure to talk with the person at the desk! (It’s usually a volunteer who has lived there a long time.) To search for museums check with the Washington Museum Association. Sleep, Eat, and Play in the Past. Stay in historical inns. Eat in local cafes with a bit of history to them. Visit local pubs or gathering places. Join in at local events. Look for handmade heritage products or other items made locally. Make it a Family Affair. Find family sites—landscapes, dwellings, graves, farmsteads, businesses, etc. Get bookish. To really understand a place’s past, read a book about the place you are about to visit. One of the best places to look for historic sites is to examine sites what has been listed on the National Register of Historic Places. These are properties that have been recognized by the National Park Service as treasure’s to our nations history and meet high standards for architectural intergrity. You can find sites listed on the National Register by exploring ourWISAARD tool. Here, you can search by city or county, or by theme, built date or architectural style. Below we have gathered some of the more unusal sites into categories to get you excited about the rich variety of resources around the State. Keep in mind that not all properties are open to the public, but you are more than welcome to enjoy from a public right-a-way!